Grab the hottest seat in town: to see the outrageous ‘The Book of Mormon’ at London’s Prince of Wales Theatre. Penned by ‘South Park’ writers Trey Parker and Matt Stone with ‘Avenue Q’ co-creator Robert Lopaz, this subversive musical satire charts the antics of two Mormon students sent from Salt Lake City to convert the natives of a poverty- and famine-struck Ugandan village. Poking fun at cultural cultural and religious mores, this subversive, goofy musical will surprise, shock, entertain and ultimately disarm you with its no-holds-barred story and controversial-but-catchy score. 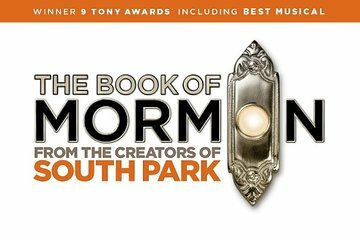 Make your own way to the Prince of Wales Theatre in central London to enjoy one of the one hottest stage musicals in town — the rip-roaring, rulebook-ripping The Book of Mormon. Having taken Broadway by storm, this multi-award-laden show charts the hilarious adventures of two mismatched Mormon Boys who swap Utah for Uganda in a bid to spread the word of the Latter-Day Saints. After being robbed on arrival by a local warlord, the twosome battle with their own beliefs to help bring change to a village whose residents believe God is the source of their misfortunes. Misunderstandings, confusions, lies and hilarity ensue as the missionaries come to terms with the realities of life in rural Uganda, including famine, poverty and AIDS. As the wild and wacky story unfolds, enjoy catchy-yet controversial numbers such as ‘Turn It Off’ and ‘Hasa Diga Eebowai' — just two of the songs that helped make the Broadway cast recording of the score the highest-charting Broadway cast album in more than 40 years! You have the choice of two seating options for the performance. Standard-price seats offer a good view of the stage, usually from the rear stalls or dress circle. Alternatively, opt for top-price seating for a full, electrifying view of the stage and the stars in the action. The show lasts 2.5 hours and includes an interval break. Your experience ends after curtain down, when you exit the theater. Make the most of your evening out by upgrading to include a pre-show, 2-course dinner at Jamie's Italian Piccadilly. Excellent! My great nephew absolutely loved it as did I and his Grandmother! Apart from some early walkouts, probably from Utah, we loved the show and laughed out loud! Bad theatre for some one who doesn't like stairs but once again the tickets were ready so we had time for a quick dinner before the show. Fantastic spoof, great show.